Game 4: LOSS -- Happy Madisons 3 Crabby Joe's 0. Game 5: LOSS -- Custom Tree Service 8 Crabby Joe's 4. Lianna had a double, 7 singles, a walk, 4 RBI and 5 runs scored. Scott had 4 doubles, 4 singles, 3 RBI and a run scored. Bill had 3 double, 5 singles, 3 RBI and 4 runs scored. Chris had 3 doubles, 2 singles, 4 RBI and 2 runs scored. Taylor had 5 singles, a walk, 1 RBI and 2 runs scored. Kevin had 5 singles and a run scored. Caress had a 3 doubles, a single, 1 RBI and 2 runs scored. Brett had 3 doubles, a single, 1 RBI and a run scored. Rose had a double, 3 singles, a walk and 2 runs scored. Robyn had 4 singles and 5 RBI. Big had 4 singles, 1 RBI and 2 runs scored. Matt had 4 singles and a run scored. Brett pitched all 31 innings allowing 27 runs, while striking out 7 and walking 4. Brett(22), Chris (22) & Robyn (22) all set the new seasonal RBI record (21; Jimmy 2007, Brett 2010, 2012). Robyn(22) shatters the mark for most RBI ever in a single season by a women (16; Caress 2011). Rose(.561) sets a new personal best for on-base percentage (.422; Rose 2011). Matt(13) scored more runs this season than he ever before (12; Matt 2009 & 2011). 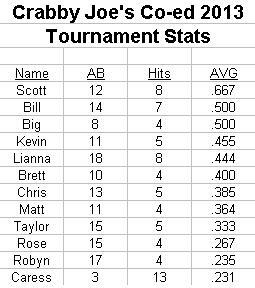 Bill(19) sets a new Crabby Joe`s record for runs scored in a season (17; Brett 2012). Scott(57) & Bill(53) both broke the the Total Bases seasonal record (52; Jimmy 2009). Scott(20), Chris(19), Bill(17) & Brett(16) all broke the previous single-season doubles record (15; Chris 2008). Brett(47) set a new career high for strikeouts in a season (41; Brett 2012). 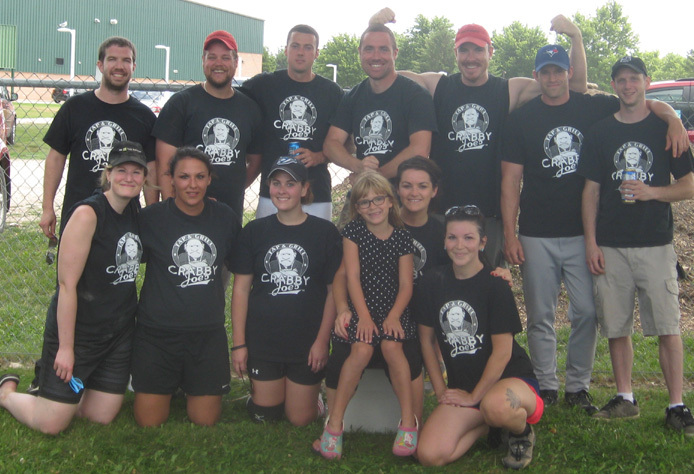 Crabby Joe's(104) has set a new team high for extra-base hits in a season (82; 2011). Crabby Joe's(5.56) defense has broke the record for fewest runs per game allowed (6.52 ERA; 2011). Crabby Joe's(30) set a new team low for total strikeouts in a season (37; 2012).